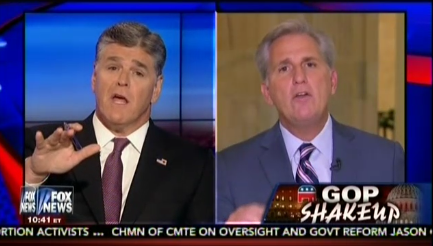 Sean Hannity was pushing hard, asking House Majority Leader Kevin McCarthy to name some promises his Republicans had actually delivered on. He scoffed when McCarthy said the party would start undoing the Affordable Care Act — “you have the power of the purse!” He talked over McCarthy when the leader and candidate for Speaker of the House suggested that the party did not need to cut funds for President Obama’s “amnesty,” because courts had taken care of it. Only halfway into the interview did McCarthy finally catch a break. The reality is both that the Republicans are playing politics with Benghazi and that Clinton cannot be trusted. The two certainly are not mutually exclusive. Clinton apologists often claim that the current scandals are all based upon Benghazi, but while there is nothing to Benghazi, there are other real issues. Clinton apologists are now using this interview to attempt to discredit valid criticism of Clinton, but Benghazi and Clinton’s other actions are separate matters. Regardless of what the Republicans are doing, it was Clinton’s own actions which caused the current scandals. It was Clinton, not the Republicans, who violated the rules. It was Clinton who deleted business-related email claiming to have only deleted personal email. It is Clinton who has been exposed by fact checkers of lying in virtually every statement she has made. The Obama Justice Department which is now investigating Clinton’s private email server has nothing to do with the Republicans. The State Department officials who have criticized her actions have nothing to do with the Republicans. The Republicans are acting irresponsibly in investigating Benghazi when there is nothing there. That in no way exonerates Clinton for her behavior. In destroying email requested by Congress regarding Benghazi, Clinton has also left the Republicans with a way to keep the investigation going for many more months. Posted in Hillary Clinton, Republicans, Scandals. Tags: Benghazi, Hillary Clinton, Libya, Republicans, Scandals, Sean Hannity. RSS feed for comments on this post.. TrackBack URL. Where will your ire be vented when Clinton is elected? If Clinton is elected, I imagine it will be much like a third term of George Bush in terms of her policies. Fortunately there are some matters where she would not be as conservative as Bush.